5 Delicious Pumpkin Pie Smoothies You’ll Absolutely Love! Nothing beats the smooth creamy filling, crispy crust and memories of cozy family gatherings. How about starting the day with all that goodness, in under 5 minutes and with the super-healthy version? 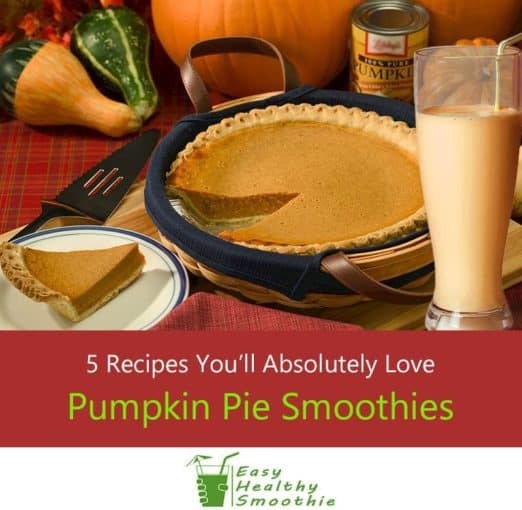 Pumpkin Pie Smoothies are among my absolute favorites, and seems there are many ways to prepare them - some are quick & easy (the ones I like!) and some more elaborate. 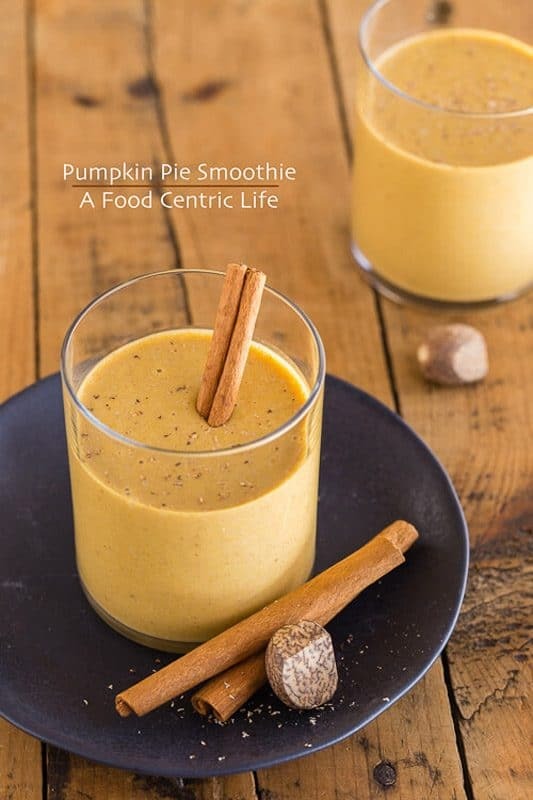 So, what should you put in a pumpkin pie smoothie to make it so delicious? Pumpkin puree of course! Other popular ingredients are banana, yogurt, coconut milk and cinnamon. Almost all recipes include pumpkin pie spice, but I’ve discovered the recipes would also work great with a pinch of ground ginger as substitute. This smoothie doesn't really taste like a pie, but boy - what a way to start the morning! It is really one of the best smoothies I’ve had for a long time. As I always strive to be out of "sweet tooth" mode, I eliminate the Agave from this recipe, and happy enough with the sweetness from the banana and yogurt. You can also drink it after workout and enjoy a delicious, protein-rich and healthy recovery. 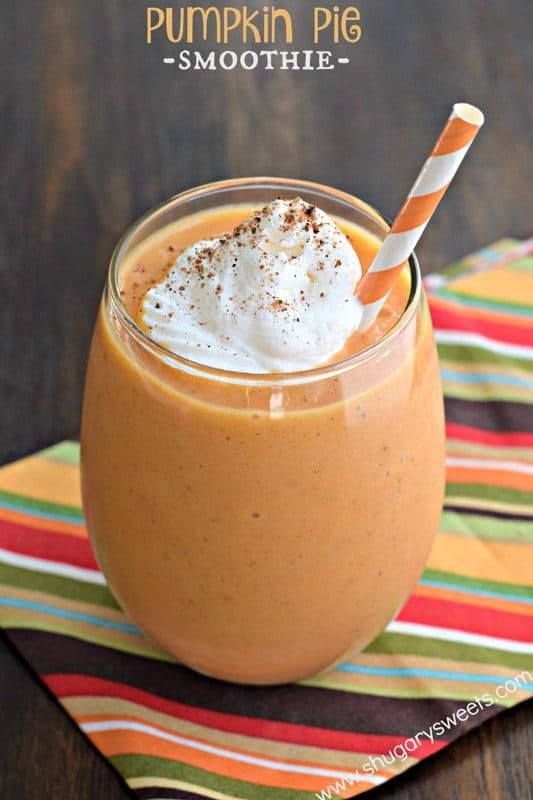 In a blender combine pumpkin, banana, ice, yogurt, spice, agave nectar and milk*. Pulse until smooth! Pour into a glass and top with whipped cream and pinch of nutmeg. ENJOY! * If desired, add a scoop of vanilla protein powder before blending. Recipe and image via thekitchn. This one works great for kids as well as adults - love the creaminess of the almond butter and the sweetness coming from the dates and banana. Add the pumpkin, coconut milk, almond butter, banana, dates, and spices to a blender and process on high until smooth. Divide between two glasses and top with coconut whipped cream and a dusting of pumpkin pie spice, if desired. You can replace the coconut milk with cow's or nut milk. It won't be quite as thick but is still delicious. 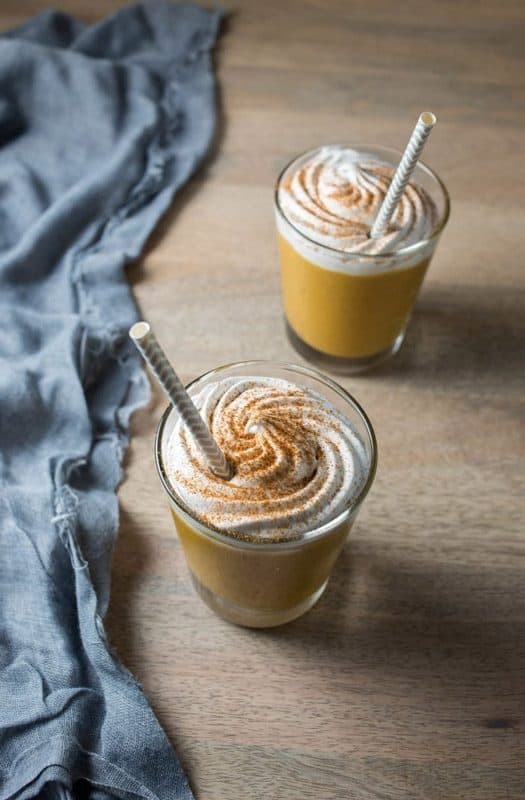 This Pumpkin Pie Smoothie features cinnamon, vanilla and clove, giving it a unique and captivating taste. The cinnamon is an awesome healthy addition, as it's known to control blood sugar, help with colds, as well as increase energy, vitality, and blood circulation. You can up the spices and vanilla in this smoothie for your personal taste. If you buy coconut milk stabilized with guar gum, it will be thicker and creamier than a brand without guar gum. Guar gum is only an issue for people with digestive issues. If you are sensitive to gums, choose a brand without guar gum. This delicious smoothie almost tastes like a dessert instead of a nutritious breakfast. It’s healthy and doesn’t include added sugar, although it is sweet enough as is. Place ingredients in a blender and blend until smooth. Add water until you get the desired consistency. 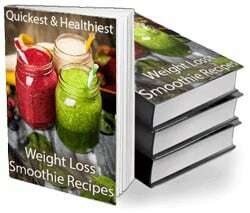 These can be made into smoothie freezer kits. Put all ingredients except almond milk and vanilla extract into a freezer bag and put into freezer. Take out the night before you want to make and add to blender with almond milk and extract. This is a delicious pumpkin pie taste-alike, but with 12g protein per serving and without all the calories, refined sugar and fat! What I like about it, apart from the heavenly taste - it is weight loss friendly and keeps you feeling full for hours. Add all of the ingredients to the blender in the order listed. Blend on high for at least 3 minutes or until smooth - this may take longer if your blender isn't very strong. Scrape down the sides of the blender as needed. Feel free to use regular (non Greek) vanilla or plain yogurt instead - keeping in mind the protein count will be lower. I prefer vanilla Greek yogurt not only for its protein count, but for its incredibly thick texture and vanilla taste. ​Instead of pumpkin pie spice, try adding nutmeg, cloves, ginger, and/or more cinnamon to taste. ​Any milk is just fine here. However, be sure to adjust the protein count accordingly if protein count is a concern. Hope you like these recipes - they’re all amazingly delicious, easy to make and will bring up the heavenly tastes of a Pumpkin Pie even on a busy morning. 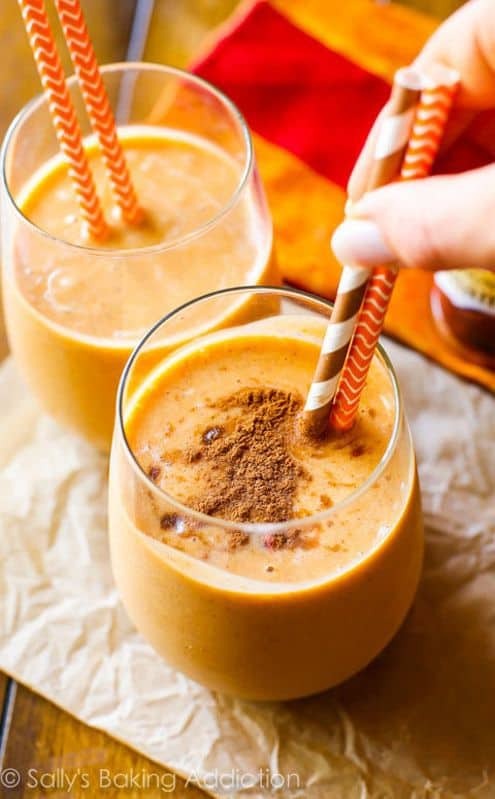 To make these Pumpkin Pie Smoothies in less than 5 minutes, what I do is freeze ahead a number of small bags with all the ingredients inside. Then every morning I just toss the bag contents into my blender and the smoothie is ready! Start your day with a smoothie that tastes like smooth creamy filling with a crispy crust and memories of cozy family gatherings... in a super-healthy version. 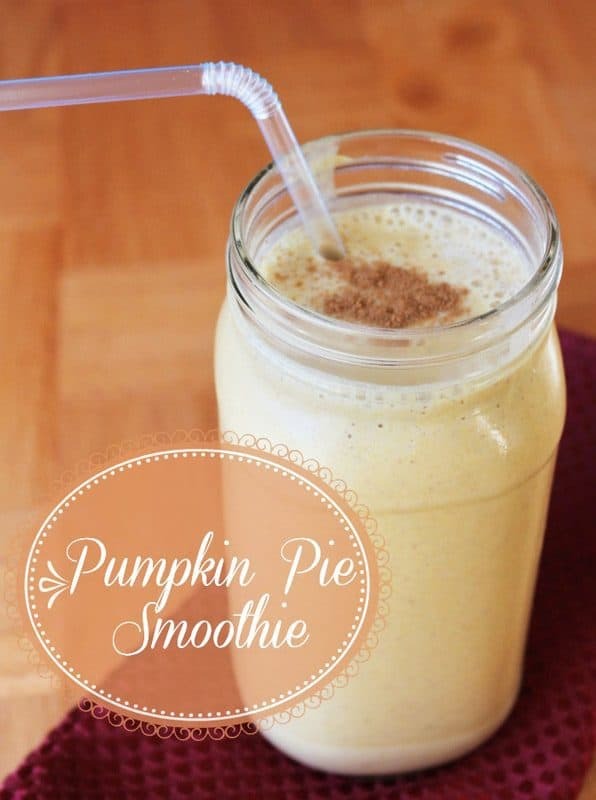 I absolutely adore pumpkin pie … how thrilled am I to see I can actually make smoothies that taste like it! You’ve just made my day!